We saw this at the Old Greenbelt Theatre this past weekend, and it was a treat. It fits in that genre of film like Waking Ned Devine or Saving Grace: the quirky charmer. Some might call it slight, as critics of Woody Allen's nomination for Midnight in Paris did of that movie. But a modest story can have great heart and true insight, and this one does. 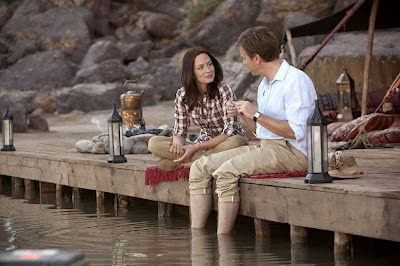 My favorite part of the movie (directed by Lasse Hallstrom) was the relationship between the leads, played by Ewan McGregor and Emily Blunt. Ewan McGregor is one of those performers, like John Travolta or Sandra Bullock, who has an innate likability and charisma that's irresistible on screen. He plays a stodgy fisheries department bureaucrat, and Emily Blunt, who is simply one of the best actors working today, plays the smart manager of an Arab sheik's account for an upscale consulting firm. An obvious romance brews during the film, but what's unusual is the way it's handled. They meet in the beginning with that touch of contrariness which seems de rigueur in movies but which is undercut here by Emily Blunt's character's intelligence and moderation. Then, throughout the bulk of the movie, the two simply get to know each other as they work on the sheik's unusual project: to build a salmon fishing industry in Yemen. There are no great tricks, no massive misunderstandings, just two people interacting and finding themselves in tune in ways they couldn't have predicted. My only quibble, other than a few scenes of schmaltz, is that Ewan McGregor's character totters between realism and farce in a way that puts him slightly outside the universe of Emily Blunt's straight realism. I see this not so much as bad acting on McGregor's part as a poorly resisted temptation on the director's part. McGregor is so incredibly cute and appealing in that slightly farcical mode that someone couldn't resist indulging it. You can't really complain about it because it's such a treat, but a little coherence is sacrificed in its wake.